When I think of July 4th, I think about being a kid and heading to the Jersey Shore with my family. I grew up in NJ but we didn't go "down the shore" often, maybe once a summer. It was special. The boardwalk was my favorite place. I'd got play arcade games and eat ice cream. Sometimes, my brother and I would get to walk around by ourselves. We were a little scared, but we'd never admit it. So many people from all walks of life in such a crowded space was such a change from my cloistered suburban world. It was very exciting. And there was nothing better than watching fireworks on the beach holding sparklers. I think my parents worried we'd set ourselves on fire, but fortunately we didn't. And now those memories are burned into my brain... funny how things that excite you and scare you tend to do that. 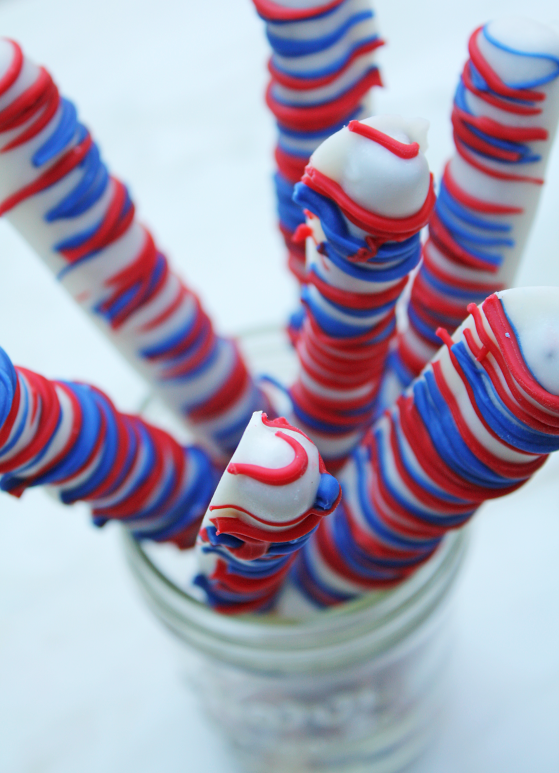 Today I'm sharing these patriotic pretzel rods Shauna at Ella and Annie Magazine styled for us. 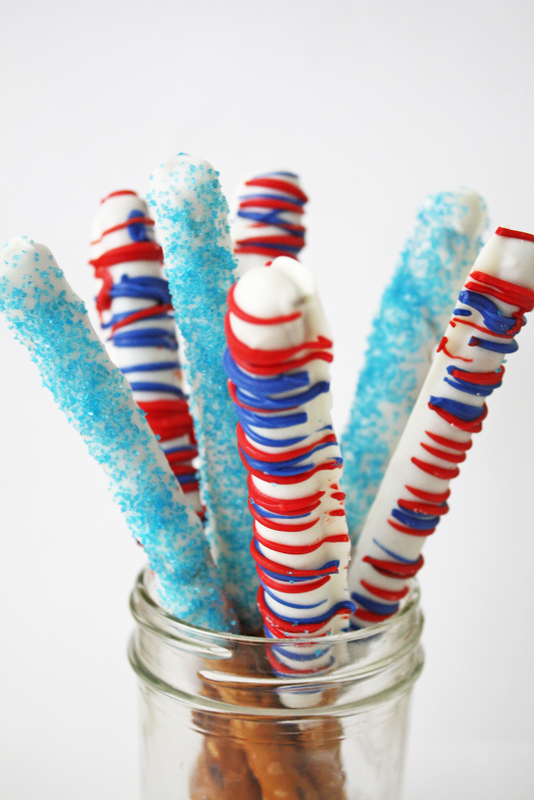 They remind me of my Jersey Shore July 4th sparklers. 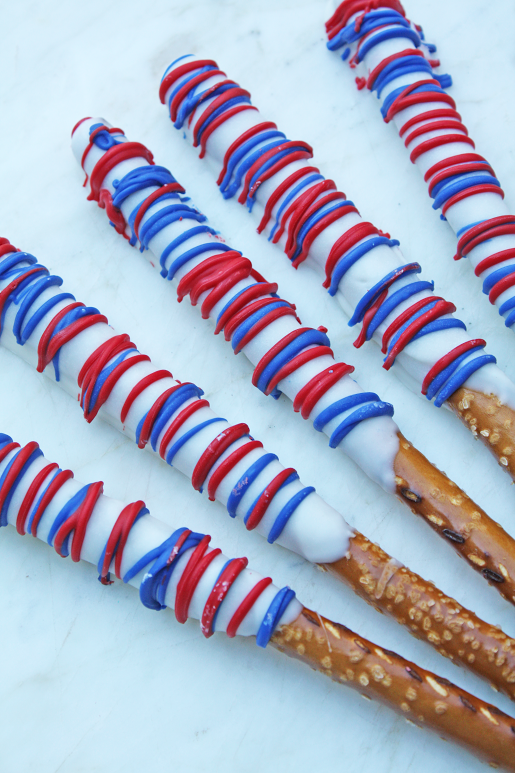 The best part about these pretzel rods is they're simple to make and look great. 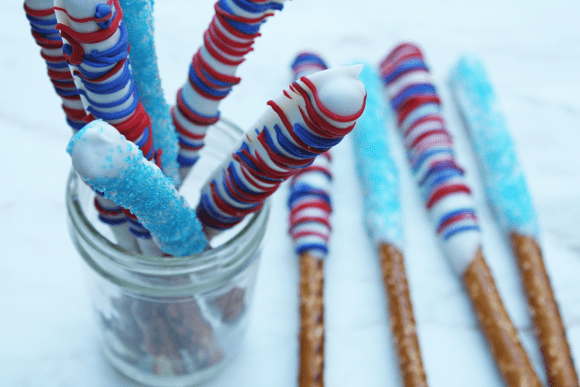 If you're searching for a quick July 4th treat, you might give these a try. Whenever I put out chocolate covered pretzels, people gobble them up. I think it's the sweet and salty together that people like. Start by melting the entire bag of white candy melts in a tall drinking glass. I used the defrost setting on my microwave. Stir every 30 seconds. Line a baking sheet with nonstick wax or parchment paper. 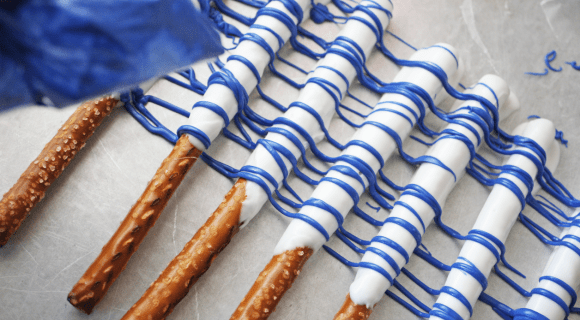 Begin by dipping each pretzel rod in the white candy coating. Gently tap off excess chocolate and place on a baking sheet. Repeat with remaining pretzel rods. Place in fridge for about 10 minutes to allow chocolate to harden. While white chocolate is cooling, take two ziploc bags and fill one bag with blue candy melts and the other with red candy melts. Microwave each bag on defrost until they melt. 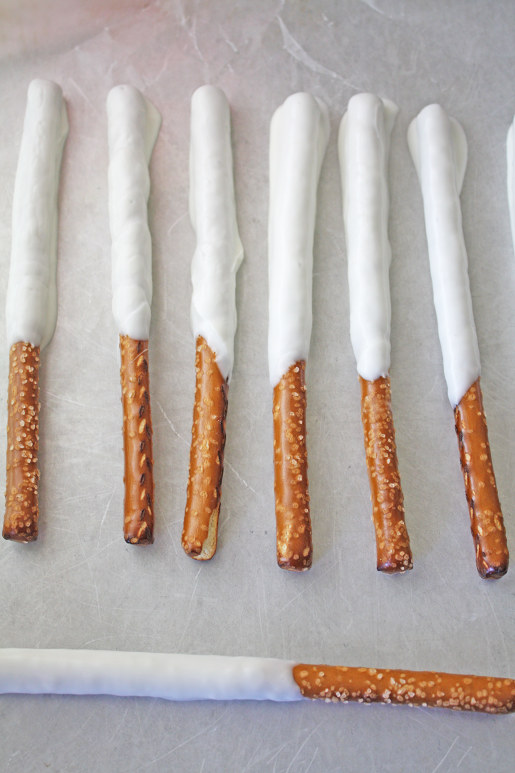 Grab the cooled pretzel rods from the fridge. Cut the tip of the blue bag off (just barely!!! or too much will come out). Going left to right squeeze the bag and make lines across the pretzel rods. See photos. Repeat with the red bag. 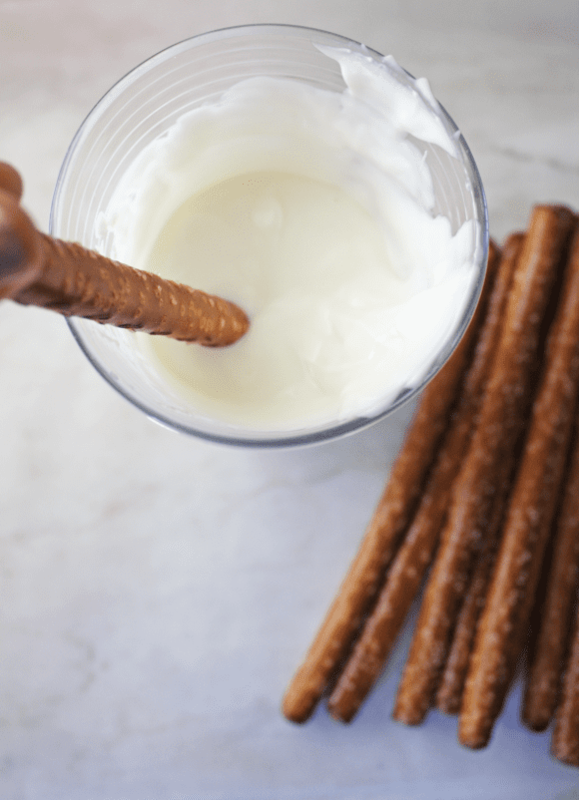 For the pretzel rods covered in sugar, just sprinkle sugar over the pretzels when the white chocolate is still warm. Place in fridge to harden. Once completely cooled and hardened, you can take each pretzel off the baking sheet and gently break off any excess chocolate. 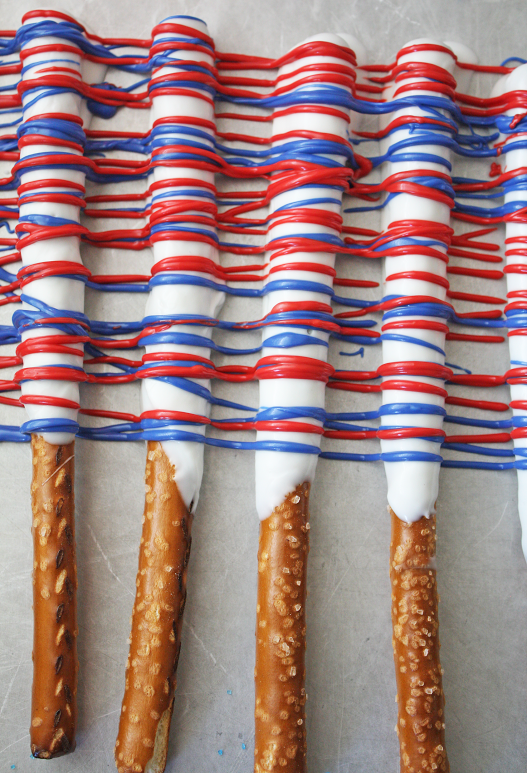 For more inspiration, check out all our July 4th parties and our free July 4th party printables! And if you love the Jersey Shore like me, please leave a comment or email me at jillian@catchmyparty.com. I'm feeling nostalgic. They look great! Thank you for posting Jillian! Heading over to see your free printables now!